How long should you stay at your first job if you don't enjoy it? College graduates aren't always thrilled with their first job after graduation, so you're not the first to ask the question. If you do like your first job, can it hurt you if you stay too long? Will it impact your career prospects if you don't make a change within a certain time period? Recent graduates often ask counselors, friends, and family members how long they need to stay in their first job before moving on. A survey from Express Employment Professionals reports that the average college graduate spends about a year in their first job. This is also the classic advice about how long to stay in any job, regardless of whether it's the first or fourth. On average, most people change jobs 10 - 15 times during the course of their career. When Can You Leave Your First Job? Average turnover time shouldn't be the primary factor determining when you make a job change. Just because many people move on after a year or so doesn't mean that you should - or shouldn't - stay that long. The answer for you might be quite different depending on your unique situation at work, what you are doing in your current position, and your plans for the future. Here are some factors to consider when you are thinking about leaving your job but aren't sure how long you should stay. Before you decide to quit, ask yourself these questions to get an idea of whether it makes sense to leave now or to stick it out a little longer. Are There Difficult Circumstances at Work? Are you being mistreated, subjected to unethical behavior or being asked to do something which bothers your conscience? If you have unsuccessfully tried to remedy the situation, then start to plan your exit right away, regardless of the amount of time that you have spent on the job. Can You Get a Better Job? What are your prospects for landing a better job? It can often be better to stay at your current position until you can secure a job that is a step up. The adage that it is easier to find a job when you are still employed often holds true. What Are Your Prospects for the Future? Is there a clear path for advancement that would enable you to transition to a more satisfying job or provide you with a more appealing boss or coworkers at your current employer? Exploring options for moving laterally or vertically at your own employer can be worthwhile before you decide to resign. Are You Acquiring New Skills? Are you developing valuable skills or acquiring knowledge that will be of use in your career? If so, you might consider staying on longer. Conversely, if you have been performing mundane tasks for more than a year then it's time to plot a change. Do You Have a Track Record of Success? Can you document a track record of success in your current job? If so, you will be more attractive to other employers and more ready to make a move. On the other hand, if you haven't acquired solid experience and new skills that will be an asset to a new employer, you may want to discuss with your supervisor options for bolstering your experience. You may wish to postpone your job search until you are better positioned. Are You Underpaid? If your salary has not increased or is below the industry average after two years in your first job, you should probably start job searching. Do research salaries so you know how much you are worth in today's job market. Do You Have Another Job Offer? If you have already applied for another job and have an offer for a better position, by all means take it, even if you have only been at your first job for a short time. One cautionary note would be that if you have only been at your first job for a short period, you may want to try to stay in your next role for at least a year. This is to avoid appearing like a job hopper. Are You Planning on Grad School? If you are entering graduate or professional school in an area unrelated to your first job then usually you can feel free to leave your first job in fewer than 18 months. Whenever you decide to leave your first job, make sure that you maintain a strong work ethic and positive relations with staff right until you depart, since you will probably want or need recommendations and references. Prospective employers might conduct background checks and get in touch with your former employer when considering you for employment. Therefore it's important to leave your job on a positive note whenever possible. Here's how to resign with class. Make sure to provide two weeks' notice if at all possible, and avoid being negative in your resignation letter or email. Should You Quit Without Notice? 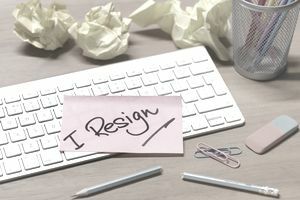 What Happens After You Resign From a Job?